Did you know you can build your very own working 3D-printed radio – without any soldering, electronics experience, electric cord, or even batteries? Digital Trends reports that’s exactly what talented Houston, Texas-based 3D-printing and electronics enthusiast Sage Hansen has created. And he’s willing to show you how to do it, too. Called a crystal radio receiver, or sometimes a “cat’s whisker receiver,” this is an incredibly simple type of radio receiver that was popular in the earliest days of radio. The only power it requires to work is the received radio signal, which is used to produce sound. It is named after its most important component, the crystal detector or diode. “AM radio was one of the first ways of transmitting audio to a very broad audience in the early 1900s, but it is still very popular today,” Hansen told Digital Trends. “It starts with the radio station converting their audio sound waves into electromagnetic waves, which can travel great distances. Each radio station uses a specific frequency that is constant, but the sound waves are mixed so they amplify and modulate the base radio wave. What makes the crystal radio so exciting is how simple the circuit is, and how it can be made out of normal household items. This entry was posted in How To, News, Radios and tagged Crystal Radio, Southgate ARC on January 14, 2018 by Thomas. 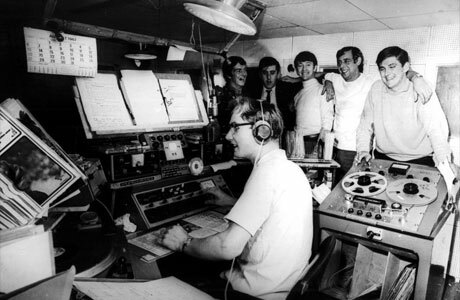 [A]t night with my younger brother we would listen to a “pirate radio station” on a boat that would put real good music on, crusing the international waters between England and France. He burst in laughter and told me: That’s Radio Caroline“. That was it. My brother and I would listen to that station nearly every night on an old “galena radio receiver” with a huge antenna hidden in the attic built with copper wire we stole at the mine. I mean we didn’t really steal it, it was everywhere. It was the wires used by miners to connect detonators to batteries when blowing new tunnels and locals were using it for all sorts of things, like holding parts in chicken coop to tie tomato or green bean plants to stakes and could be found everywhere. Actually at first we set the antenna in our bedroom but somehow it wasn’t long enough not to mention mom who saw it and tore it down giving her an other excuse to punish us. So we decide it to place it in the attic where no one ever went. Read the full story at République No.6. This entry was posted in AM, Broadcasters, News, Nostalgia, Pirate Radio, Radio History and tagged Crystal Radio, Radio Caroline, République No.6 on August 9, 2015 by Thomas.